Another Long Walk: Day 58: Santiago! October 8: It rained overnight—a lot!—but my tarp did me proud and kept me dry. By morning, the rain had stopped, but an extremely thick fog with fat drops seemed to seep into everything and tree snot from the eucalyptus trees kept hitting my tarp, so I wasn’t always sure if it was actually raining or not without looking into the clear cut of trees. Most of the day’s hiking was an unpleasant road walk. I’ve seen photos of the Santiago Cathedral from a distance that seem to dominate the skyline, and I kept my eyes open for that, but I never saw it through the thick fog. I didn’t stop for any but the briefest of rest breaks and a drink at a trailside restaurant. I was anxious to see Santiago in person, and anxious to arrive before the rain started—a probability that seemed to increase throughout the day. I followed the yellow arrows through the streets of Santiago until I arrived at the square in front of the cathedral, a towering masterpiece of architecture. It was the end of the Camino. Oh, sure, I still planned to hike on towards Finisterre, but //this// was the “real” end of the trail. This is where 95% of the people who walk the Camino call it quits. Looking around, I was surrounded by dozens of other people, many of which were clearly pilgrims, but nobody I recognized. I felt a little sad about that. It somehow seemed wrong to have arrived by myself like I did. I didn’t go inside the cathedral—not yet, anyhow. Mass is held each day at noon, and I had missed it by a couple of hours. I would return tomorrow for mass, and I didn’t want to see the inside of the cathedral until then. In the meantime, I had a reservation at a hotel to check into. I didn’t know the name of the hotel, nor did I know it’s location. I had gotten online briefly the day before at a computer station in a restaurant when I made the reservation, leaving my pack with the Australian girls at the time, so I had nothing to write with or write on after I made the reservation. The information was online, though, if I could find somewhere to get online. But I was pretty sure I remembered that the word “nest” was in the name of the hotel, so I wandered over to the tourist office where I had my credential stamped, picked up a map of the city, and asked if they had a list of the available lodging in town I could look through. They did, and I scrolled through the list looking for a place with the word “nest” in the name. I didn’t find it, though, and scrolled through the ten pages of the list a second time to make sure I hadn’t overlooked it, but I still didn’t find it. Shoot. I asked about Internet access, and the woman at the tourist office said that a restaurant just around the corner from there had wi-fi. Perfect! I thanked her and headed out to the restaurant. I pulled out my laptop, but the wi-fi connection required a password. Drats. I suppose I could actually BUY something and ask for the code, but I just wanted to log in for the ten seconds it was necessary to look up my reservation details. The guy at the table next to me was typing on his laptop, and I asked him if he was online and new the password to get on. No, he didn’t. Drats! But a woman passing by had heard me and said she had eaten there the day before and had the password. She went to look it up on her cell phone, but the password was obscured as passwords often are and she couldn’t read it to me. She didn’t have a problem with this and gave me her phone. I don’t have a cell phone, smart or otherwise, and I’m not particularly experienced figuring out how to navigate the web on them. Trying to go back a page after clicking a wrong link, or finding the “login” button when I did get to the right website—these were all challenges for me. It probably took me close to five minutes—far longer than I would have imagined—but I finally managed to look up my reservation for the “Nest Style Hotel Santiago” and the address. I found the street on my map from the tourist office and now knew where I was going. =) I used booking.com for my reservation (if you ever need a hotel reservation in Europe, I think this is THE website to use for it), and the woman started asking me all sorts of questions about it. She hadn’t used it before but had heard a lot about it. Since she was kind enough to lend me her cell phone to look up my reservation, I helped explain to her how that website worked and helped her make a reservation for herself in Barcelona a couple of days later. She had a reservation to fly back to the United States from Barcelona. It’s an usual option back to the states, and I asked why she didn’t get a flight back from Madrid like most people do. It’s closer and cheaper to go to. “I’m flying US Airways,” she told me. I finished my drink and potato chips, then headed off in search of my hotel. I found it about ten minutes later, right where my map said it would be, and checked in for the night. The room was small but serviceable, and I had my own private bathroom that wasn’t crowded into the size of a small closet. I hate those showers that are so small you can’t even bend over to pick up that dropped bar of soap or you have to step out of the bathroom just to dry off with your towel, so I was pretty happy to have the full-sized bathroom at my disposal. =) And all for just 35 euros. Almost all of the other hotels in town were going for nearly twice that amount. After showering and cleaning up, I headed back to the hotel lobby and returned my key to the desk clerk. (They want you to turn in your key whenever you leave the hotel.) I asked where the nearest grocery store was, and the desk clerk told me outside, right across the street. I walked outside, and sure enough, there was a large grocery store. I felt a little sheepish that I hadn’t noticed it on my way in. =) I did my grocery shopping, then headed back into the historical town center where I checked in at the pilgrim’s office to register my successful walk. I arrived there at close to 7:00 and avoided the crowds earlier in the day. An English-speaking man greeted me when I entered the room, and asked where I had started from. “Le Puy-en-Velay,” I answered. He said, “So you started, what? Last week?” Obviously a joke. He congratulated me on my hike—certainly not the longest one anyone has done, but definitely one of the longer ones they see arriving into town and told me to walk up to the counter in the next room and they’ll take care of me. I did so, and had my choice between three different clerks twiddling their thumbs. I picked the guy closest to me, and he took my two credentials, looking through them and asking me about the purpose of my journey since they give people a different compostela depending on the reason. I said something about it being a “cultural journey” for me, and they stamped both of the credentials I had used, had me fill out a form with my name, citizenship and where I started from, handed me a compostela, return my credentials and congratulated me. 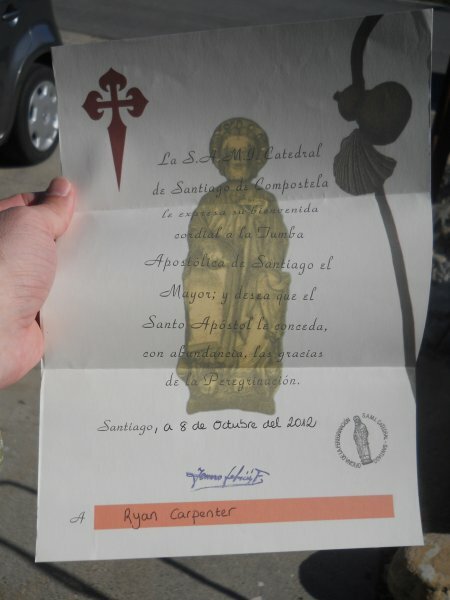 The compostela, my certificate for having completed the trail. According to the church, half of all my sins have been washed away upon completion of my journey. Had I hiked in a Holy Year (the next one is 2021), all of my sins would have been washed away. I didn’t feel any different, though. The only difference was that now I had a sheet of paper that said something in Latin that I couldn’t read. And truth be told, it wasn’t even a very pretty piece of paper. No artful design. No colorful images of the cathedral. Just a flat, off-white sheet of paper. And that was my first problem: What do to with that sheet of paper. It seemed like it would be wrong to fold it up or bend it, but I didn’t have anywhere in my pack that I could safely store a sheet of paper without damaging it. Many pilgrims, I was told, buy little tubes to store it in, rolled up safely, until they get back home. I didn’t really want to carry a tube, though, and they didn’t have anymore available at the pilgrim’s office anyhow. I rolled it up and carried it for the time being, but I’d have to do something with it eventually. Then I headed back to the hotel for the night. The laminated welcome page they had in my room said you could switch the TV to English, but the directions for that weren’t particularly clear. So I bungled around with the TV remote control for about ten minutes before I figured out how to change many of the stations into English. English! Not off the stations were in English—their local news, for instance, didn’t have an English-language counterpart. But now I could watch exciting shows like Two and a Half Men, American Dad, or CSI in English. =) Oddly, The Simpsons was still in Spanish. I knew there was an English-language counterpart for that show, but for whatever reason, it wasn’t available. the weather certainly wasn’t good either! A courtyard outside of the cathedral. The Santiago Cathedral! I had made it! A woman getting her picture taken with a pilgrim statue, you think?